Not to Rain on Wills Parade, but..
As a long time baseball fan (Orioles in the 1970s glory years right on through to young Cal in the early 80s…) I’m as much as anyone thinking the Cubs are due their title. But Will, in all your excitement of the standings, get real with how the central division stacks up even in the East, much lest the west. 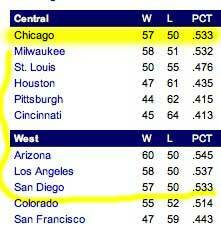 Toss the Cubbies in the Wild West, and they land in 4th place! I’m not boasting the baby Dbacks will not wilt again come September, but those cute little cats might have a lot of work to do with the Western Snakes and friends.